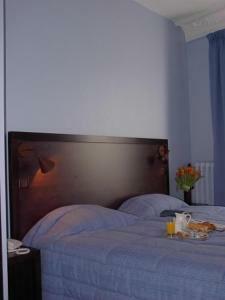 Relais De Paris Gare Du Nord, Paris discount hotels and accommodation. Less than 5 minutes walk from the Gare du Nord station, this establishment, with a traditional Parisian façade, benefits from an excellent location for Eurostar and Thalys arrivals. Near Montmartre and Sacré Coeur, this hotel also has direct metro access to Etoile and the Champs Elysées, Les Halles and the Stade de France. This new establishment, completely renovated and tastefully decorated, offers 64 modern rooms and a high level of comfort. All the rooms are equipped with satellite TV, direct dial telephone, internet connection, bathroom (bath or shower) and hairdryer.RENOVATION WORK AT THE RECEPTION IN PROCESS. View photos, room descriptions and make online reservations at Relais De Paris Gare Du Nord. Save on room prices at Relais De Paris Gare Du Nord, Paris.